The Regional Final at K2 on Wednesday was a real chance for our athletes to experience competing against some of the best in the south east. 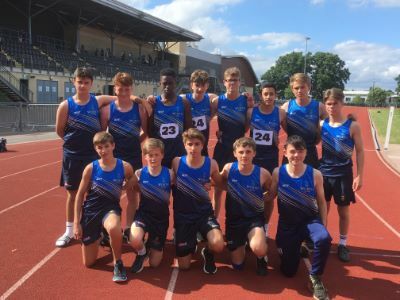 This was very much a team effort and the intermediate boys finished in 10th place which may not sound amazing but when you consider that there were about three hundred schools in the south east that originally entered. The outstanding performance came from Alfred Lord in the Triple Jump, winning the event and scoring almost maximum points. On Thursday it was the turn of the girls to compete in the West Sussex Girls PE association meeting. Both Juniors and Inters recorded a series of wins and although we are still waiting for the final scores, I am confident Worth will have been triumphant in both age groups. Many of the same athletes from Year 7 & 8 had the Sussex Independent Prep Schools trials on Friday, together with a select group of boys. With all the prep schools in Sussex represented this would also be a real test. The Worth girls and boys all did extremely well but some were outstanding. Jessica Hennessey was a double winner in both the 100 and 200m, dominating the field. Daniel Aghado-Jacobs also won two events, the Long and Triple jumps. Leo Camelleri won the 800m and was 2nd in the 100m after a photo finish. Megan McLoughlin was 2nd in the final of the 100m. All of these athletes would normally be selected to go to the National Championships in Birmingham but this clashes with their trip to France and will mean they cannot go but they should be very proud of their efforts. Leo Camilleri will be travelling to the Nationals to represent Sussex in both the 100m and the 800m. He has worked hard to reach this level and we wish him luck.